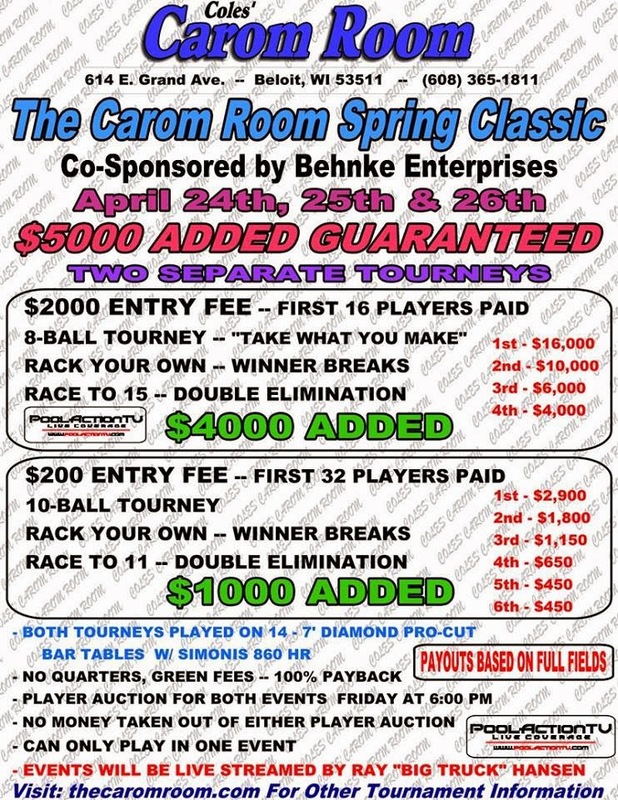 This past weekend the Carom Room Spring Classic $2000 bar-box 8 ball tournament in Beloit Wisconsin was played. This was a star studded field with the likes of Dennis Orcollo, Shane VanBoening, Darren Appleton, Jason Klatt, John Morra all in attendance. In the end it was Sky Woodward who double dipped Shane VanBoeining in this true double elimination final. The "Prince of Pool" Corey Deuel was also in this field. He is a multiple Mosconi Cup team member and former U.S Open Champion. On top of many people suggesting that he could be the best bar-box player in the world, he is also one of the most knowledgeable players when it comes to racking and breaking the balls. In fact he is so adept with his racking and breaking techniques that he has become a controversial figure in pool. 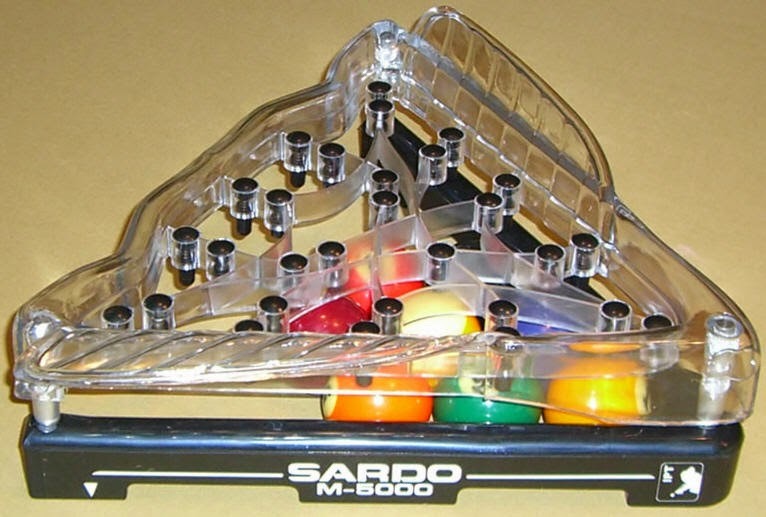 When I first got into the "pool scene" in the mid to late 2000's, I remember the outrage from fans and fellow pro's for his mastery of the Sardo Tight Rack. This was a new rack on the market at the time that tightened the balls in an almost machine like fashion to provide a "perfect rack". The reason why this was a "perfect rack" is because the balls were tapped into place upon instruction from the Sardo company. This is called training the cloth, the rack helped in arranging the balls into the divots. After some time with this new rack he was able to figure out a way to consistently pot the wing ball and to have a reasonable opening shot by soft breaking the balls. With his world class ability these racks were almost too easy as his run-outs were abnormally high even compared to other pro's. For certain purists they believe there should not be this type of consistency with the rack, and that running out carbon copy patterns over and over again does not demonstrate much skill. To others the game is simply about winning the most racks and if you are doing that by breaking and running more racks than the others based on superior knowledge, then all the more power too you. This past weekend Deuel once again caused a stir with his racking and breaking techniques. In a match early on in the tournament, Deuel was up against Canada's #1 player John Morra. Check out the video below to see what he was doing. As you can see this was not a traditional break by any means. Deuel clips the last ball in what looks to me like a straight-pool break. He does so intentionally to make the 5 ball cross corner. Right away any pool player can tell that this will be a challenging rack to run-out as he does not break out the 8 ball at all. However if you look closely Deuel has patterned racked the balls in such a way that by hitting it at the speed he did only the solid balls came out of the pack, with the exception of two striped balls. This allows Deuel to have complete control of the rack. Because at this point if he misses, Morra's stripes are all clustered together with the 8 ball directly in the center of the pack making for a very tough out. Another top ranked Canadian player who was also there, Jason Klatt had this to say when asked about the Deuel break. "Well if he broke like that vs. me I would like it cause he needs to come with some Houdini outs. And I like the slow grinding games personally. He just did it to change the pace of the match and mentally breakdown his opponents. I love that stuff." On the other hand there are those who feel like this is nothing more than a gimmick that cheapens the game. After the match with Morra, Deuel took to Facebook and stated to his followers that he just won a tight match against Morra 15-13. It would be an understatement to say Morra was bothered by this, as he took to Facebook and criticized Deuel's methods. This debate ended as all good arguments between world class players should, which was by Morra challenging Deuel to a high stakes money match. I also reached out to the "Prince of Pool" to inform him of this story and wanted to know his thoughts to the question I had. Which was how he feels about the divide in opinion his techniques has caused. Some peg him as a genius and some think these types of tactics diminishes the game. Deuel had this to say, "Can't hurt the sport...it's the worst I've seen...I like to try new things maybe this will spice it up a bit. Shane has been winning last few years but still no money in the game... and his break is very flashy and exciting...but the run outs are too easy...and rotation games are self explanatory ...1 then 2 then 3 ...viewers that don't know what 'English' is get bored to death. It appeared to me that Deuel who is a veteran on tour, is more concerned about the current state of the game. This is a guy who has seen the sport come down to a historic low in America, and I get the feeling that he thinks his tactics are far from the biggest concern facing the sport today. Personally I am divided on the whole issue, so I am curious to what you the readers have to say. Feel free to join us on the Cue Sport Nation Facebook page to get in on the discussion. Finally it should be noted that Deuel was forced to abandon this method. I was informed by Ray Hansen at Pool Action Tv that this tournament was played under the Billiard Congress of America Rules (B.C.A). The ruling was this was not a "random rack" which is a requirement by the B.C.A, thus he was no longer able to use it. Why hasn't pool been live streaming on twitch.tv? Poker has caught on big time with this social media live feed app. Can someone look into it and possibly get a live feed of this event up on twitch?